Originally published in EARTH Vol. 56 (No. 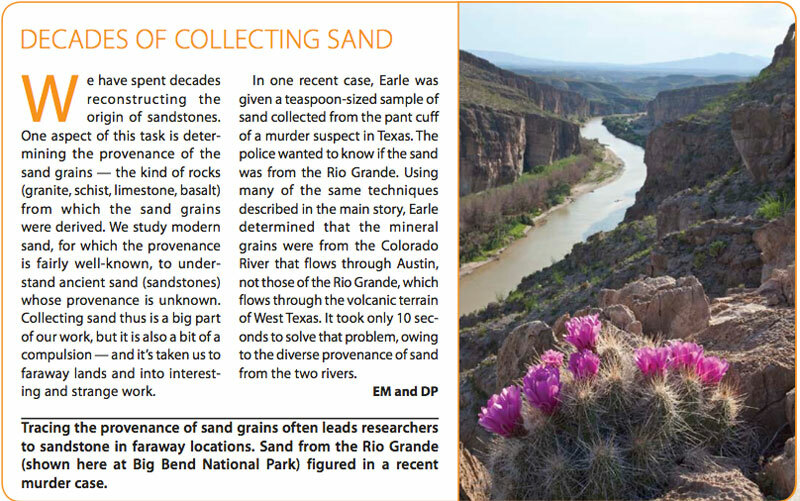 6), p. 38, June 2011.All text and image courtesy of © EARTH Magazine; Copyright © 2011 American Geological Institute. All rights reserved. Before dawn on June 6, 1944, more than 160,000 Allied troops began storming the shores of Normandy, France, in what would be the turning point of World War II. Troops poured out of planes and off ships along an 80-kilometer stretch of coastline. More than 5,000 ships and 13,000 airplanes supported the ground troops. The battles were bloody and brutal, but by day’s end, the Allies had established a beachhead. Gen. Dwight D. Eisenhower said the operation was a crusade in which “we will accept nothing less than full victory.” Less than a year later, the Germans surrendered, and the Western Front of World War II came to an end. 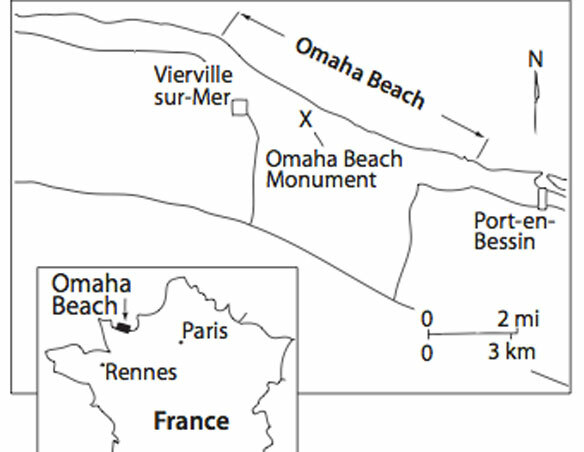 Omaha Beach was the code name for one of the five Allied landing points on D-Day. The 8-kilometer-long beach faces the English Channel, and was the largest of the D-Day beaches. Today, the only visible indications of the horrific battles fought at Omaha Beach are some concrete casements above the beach and nearby cemeteries that quietly mark the thousands of lives lost. 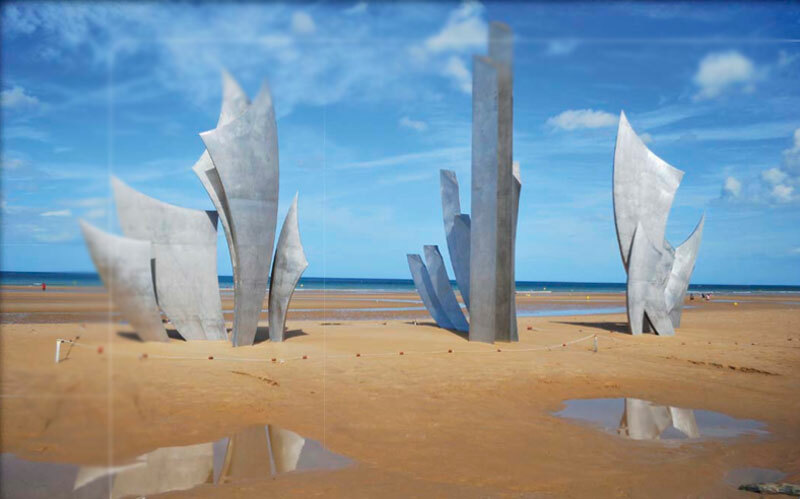 …there is more to the legacy than just the memorials: The sand at Omaha Beach retains remnants of the devastation. If you look a little closer, however, you will see that there is more to the legacy than just the memorials: The sand at Omaha Beach retains remnants of the devastation. A study of the sands revealed bits of shrapnel, and iron and glass beads that have been reworked by the English Channel’s waters over time, a microscopic record of the battle. Capturing Omaha Beach was the objective of U.S. Army forces commanded by Lt. Gen. Omar Nelson Bradley. They numbered 34,250. The U.S. and British Royal Navies provided sea transport. Strategically, this landing was necessary to join American forces at Utah Beach to the west and British forces at Gold Beach to the east. The Germans were ready for the Normandy invasions. In early June 1944, German forces under the overall command of Field Marshal Erwin Rommel occupied strong points along the northwest coast of France, entrenched in high ground above the beaches of Normandy. At Omaha Beach, arching bluffs as high as 60 meters offered strategic positions, and the Germans left no part of the beach uncovered. The entrances of gullies, running from the shore to the bluffs, were especially fortified with soldiers, 7,800 men of the German 352nd Infantry Division,commanded by Gen. Dietrich Kraiss. Rommel’s plan was to stop any invasion at the water line, which he and Kraiss believed was possible. Very little went as originally planned for the Allies. 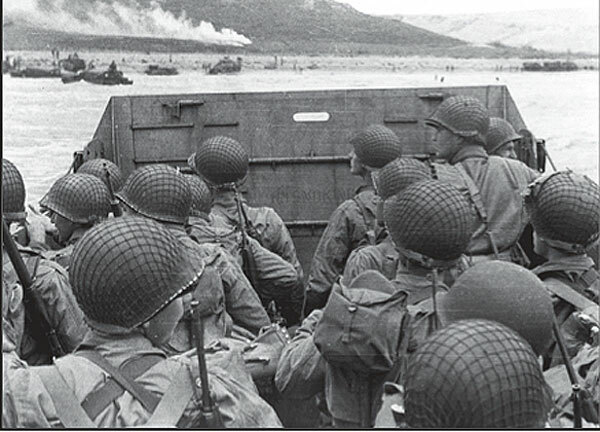 Most of the landing craft missed their target; many of them never reached the beach at all. The pre-landing Naval bombardment was ineffective and likely inadequate, killing few Germans (but many cattle). Engineers struggled to remove obstacles. 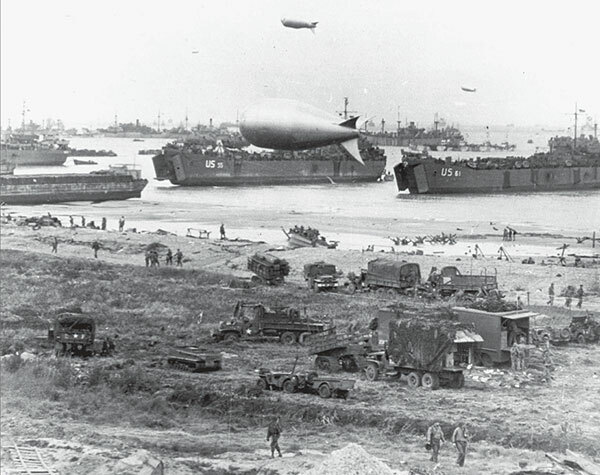 At Omaha Beach, for many hours, Allied troops could not get off the beach, and the landing nearly failed. It was the most tenuous of all Normandy landings. At one point, Bradley considered evacuating his forces. But in the end, the invasions succeeded. Despite losing more than 9,000 Allied forces on D-Day, the invasions opened up a path for 100,000 Allied troops to march across Europe, pushing back the Germans as they went. Forty-four years after D-Day, on the morning of June 8, 1988, we visited Omaha Beach. Like most visitors, we started at the War Memorial. 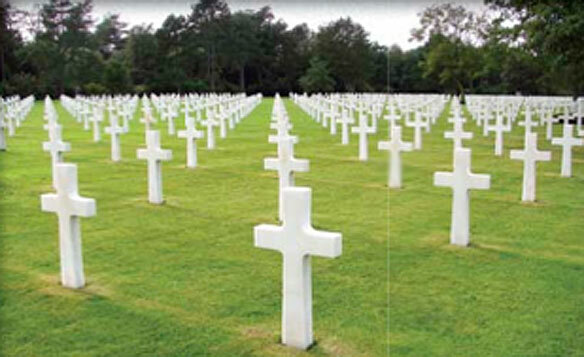 The thousands of small white crosses and Stars of David evoke the ghosts of those who perished in the battle. From there, we wandered down to the beach itself. Bound at each end by rocky cliffs, Omaha Beach is a gently sloping tidal area; on average there are about 275 meters of land between low and high water marks. The beach looks pristine. It rained the night before our visit, and it was still raining as we hiked through the sand. Fragments of mollusk shells glistened, and water ran through rills. As collectors of sand and sandstone around the world for more than five decades, we never miss an opportunity to gather sand. So as we walked, we bent down and scooped up sand samples at the high-tide point. Little did we know what we would find when we got home and started studying the sand. When we returned to our labs, we examined the sand using several microscopes: a binocular optical microscope, a polarizing optical microscope and a JEOL scanning electron microscope, each of which provides different information on grain size, shape, roundness and composition. 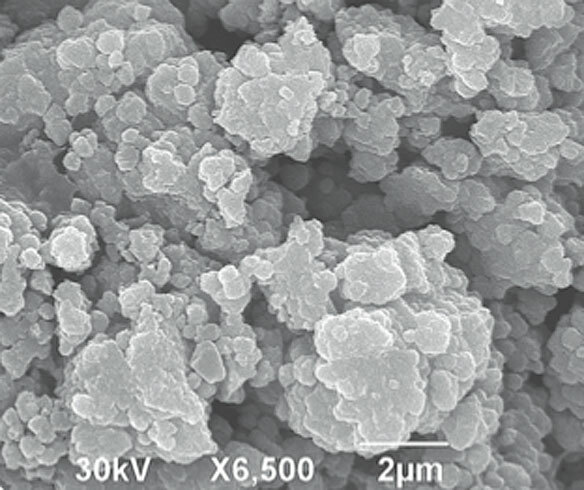 A thin section of the sand revealed a large number of angular opaque grains that were magnetic…we concluded that the metal and glass particles were human-made particles generated from the explosions of munitions during the Normandy landings. The sand is light-gray, well-sorted, subangular to subrounded, fine to medium-grained and dominantly detrital quartz (78 percent), with about 9 percent feldspar, 4 percent carbonate grains (bioclasts and limestone clasts), 3 percent heavy minerals, and 2 percent chert and other rock fragments: Although beach sand varies widely, the sand composition of Omaha Beach reflects typical sand eroded from sedimentary rocks inland and carried to the shore by the Seine and several small rivers. But the sand also contains some artifacts that took us a while to recognize. A thin section of the sand revealed a large number of angular opaque grains that were magnetic. Shard-like, they were only slightly rounded. Some were well-laminated. These grains were also associated with small spherical beads of iron and glass. At first, we were uncertain of what we were looking at. However, in a few days, we concluded that the metal and glass particles were human-made particles generated from the explosions of munitions during the Normandy landings. After further testing, we determined the sand does indeed contain 4 percent shrapnel and trace amounts of beads of metal and glass. Because waves and currents on any given day can selectively concentrate sand grains of a given specific gravity, we cannot be certain that our sample is representative of the entire beach, that shrapnel grains make up 4 percent of Omaha sand as a whole. 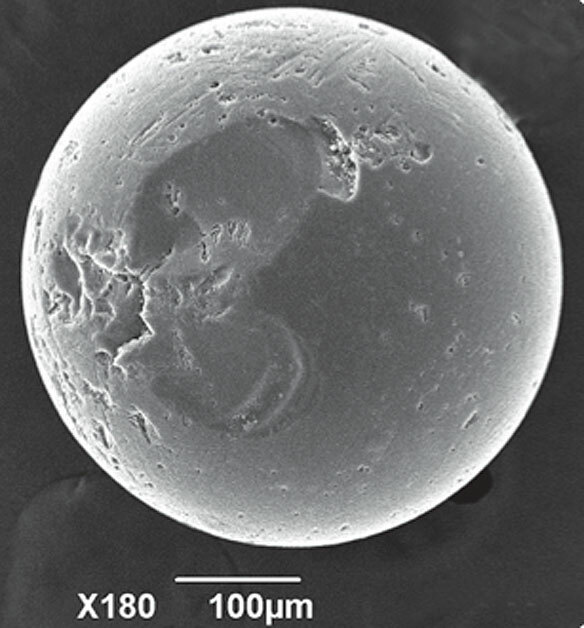 We found that the shrapnel grains range from very fine to coarse sand size (0.06 to 1.0 millime- ters) and display a variety of shapes and degrees of roundness. Nearly all of them retain their original nonspherical shapes, but all grains, even the most shard-like, have had some of their sharp edges blunted as can be expected by abrasion in the swash zone of a beach (the area where waves break, carrying sediment up onto the beach and dragging it back into the water). The coarsest grains generally have undergone more rounding than finer grains. The majority of grains have a laminated structure visible under magnification. The shrapnel grains have a dull metallic luster, except where red and orange rust survives on parts of grains protected from abrasion. They display various degrees of roughness, due to microporous surfaces produced during iron production and post- explosion corrosion. Corrosion products such as hematite, other iron oxides and biofilm made by iron-oxidizing microbes coat almost all surfaces, even those not visibly covered by rust. In addition to the shrapnel, we also recovered 13 intact spherical iron beads, five hollow broken ones and 12 glass beads. The iron beads range in size from 0.1 to 0.3 millimeters in diameter. Most of them display a shiny luster on their outer surfaces and are nearly free of corrosion products. 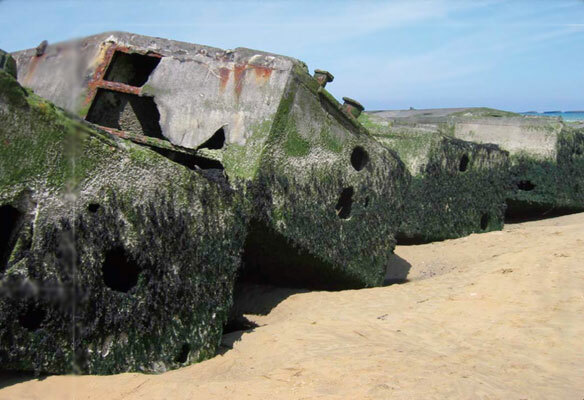 Exactly how long the shrapnel and glass and iron beads will remain mixed in the sand at Omaha Beach is uncertain….. The glass beads are remarkably uniform in size, between 0.5 to 0.6 millimeters in diameter, and are almost all spherical. The surfaces of beads are mostly smooth, with a few scattered divots, rare scratches and conchoidal spall pits. The beads are composed of clear glass, but they have various degrees of cloudiness, depending on the abundance of bubble inclusions. Interestingly, the glass is not a pure silica glass, like one might expect to see. Energy dispersive spectrometer data show the presence of small amounts of calcium, sodium and magnesium, in addition to silicon and oxygen. We soon figured out the source of the unusual glass components and the other strange bits in our sand sample. It’s probably not surprising that we found shrapnel and glass and iron beads in the sand at Omaha Beach. The hardness of shrapnel ensured its survival in the sand. But what’s interesting is that the disparity in degree of rounding of shrapnel grains of the same size shows that, although originating on the same day and barring no major differences in hardness, the grains have not all had the same abrasion history and have not undergone continuous abrasion on the beach. It appears that some grains spent variable amounts of time in residence on the storm beach, the coastal berm, or an inner- shelf setting. We think the glass and iron beads that we found were formed by munitions explosions glass beads from explosions in the sand and metal beads from explosions in both the air and in the sand. Such explosions would have been hot enough, at least 1200 degrees Celsius, to melt iron and heat quartz. Michael Martinez, supervising forensic scientist for Bexar County, Texas, says bomb explosions commonly produce hollow metal beads: Heat melts the iron, causing it to rain down in little pieces. The explosions on their own probably wouldn’t have been enough to melt the quartz and form glass, but sodium and calcium present in seawater would have lowered the quartz’s melting temperature, allowing it to melt along with the iron upon explosion. It is likely that the scratches on the exterior of the glass beads formed while the beads were soft and undergoing turbulent rotation and impact with other particles just milliseconds after the explosion that generated them. Divots and chips formed from impacts with other particles after the glass had solidified, although whether this occurred in the air following the explosion (most likely), or on the beach, is uncertain. Not all of the sands from the D-Day beaches resemble the sand at Omaha Beach. Sands from Utah Beach, where the combat was less fierce, had no shrapnel in the sample we collected. We haven’t checked the other landing sites. It is of course not surprising that shrapnel was added to the Omaha Beach sand at the time of the battle, but it is surprising that it survived 40-plus years and is doubtless still there today. Exactly how long the shrapnel and glass and iron beads will remain mixed in the sand at Omaha Beach is uncertain. Iron on its own can probably survive beach abrasion for hundreds of thousands of years. But the combination of chemical corrosion and abrasion will likely destroy the grains in a century or so, leaving only the memorials and people’s memories to recall the extent of devastation suffered by those directly engaged in World War II. McBride is a professor emeritus at the University of Texas at Austin. Picard is a professor emeritus at the University of Utah in Salt Lake City. Both are sedimentary petrologists students of sedimentary rocks, the most common rocks on Earth’s surface. © D-Day’s Legacy Sands by Earle F. McBride and M. Dane Picard, published in EARTH Vol. 56 (No. 6), p. 38, June 2011. REPRODUCTION: More than one photocopy of an item from EARTH may be made provided that fees are paid directly to the Copyright Clearance Center, 222 Rosewood Dr., Danvers, MA 01923, USA. Phone: (978)750-8400. Fax: (978)646-8600. Any other form of reproduction requires special permission from and is subject to fees by EARTH. Information about obtaining reprints of this article or about obtaining permission to reproduce this article in whole or in part can be found by e-mailing earth@earthmagazine.org. EARTH is published monthly for a base subscription rate of $36.00 a year (single copies $5.99) by the American Geological Institute. © 2011 American Geological Institute. Standard mail, nonprofit postage paid at Denver, Colo., and at other mailing offices. Claims for missing issues will be honored only up to six months. Issues undelivered through failure to notify EARTH of address change will not be replaced.